I started posting about districts of Himachal Pradesh, started from Chamba District I will be posting about all districts sequence wise. I welcome your suggestions in comments. You might have heard songs regarding Chamba, Maaye Ni Meriye – By Mohit Chauhan, or Parvat ke Piche, Chambe Da Gaun – from Mehbooba Movie. Chamba has been a popular destination for tourists because of its beautiful places, valleys, and Mountains. 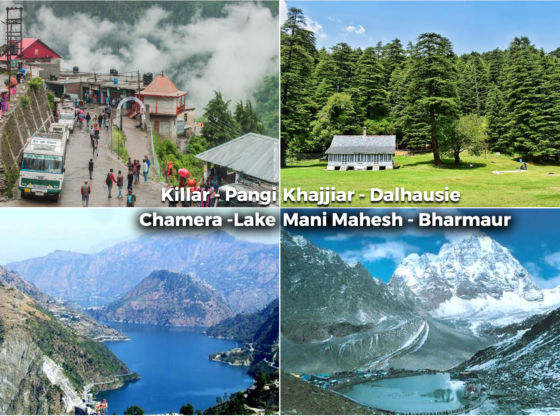 The towns of Dalhousie, Khajjhiar, and Churah Valley are popular hill stations and vacation spots for the people from the plains of northern India. Chamba is the only district in northern India to preserve a well-documented history from c. 500 AD. These are most closet locations when you travel Chamba. You can choose to stay in Chamba or Dalhousie. Khajjiar is the most beautiful place in Himachal and it is called “Mini Switzerland of India”. I am attaching a few pictures of Khajjiar. You can spend the whole day in Khajjiar and meanwhile, you can choose to do Paragliding. Dalhousie is a very beautiful place and it was named after The Earl of Dalhousie, who was the British Governor-General in India while establishing this place as a summer retreat. Chamba town is famous for Chaugans. Chaugan, located in the center of the township, is a hub of all social and cultural activities. Meaning four-sided; the arena is enveloped in the midst of administrative buildings and a shopping center. Laid during the British era in 1980, Chaugan has a terraced green grass surface which is 800 m long and 80 m wide. There are many temples in Chamba, Brajeshwari Devi Temple, Laxmi Narayan Temple are few of them. This lake is another attraction for photographers and therefore it needed separate attention. It is located near the town of Dalhousie on Chamera River, If you get Administrative Permissions do visit Chamera 2 Hydroelectric Power Plant. Trust me it was an amazing experience. Dainkund is the highest peak in Dalhousie, offering you a 360 Degree View of the area. From the military barrier at Dhainkund, a scenic 1.5 km ridgeline walk leads to the Jai Pohlani Mata Temple, with a teahouse and great views of the Pir Pinjal range. It is located about 8.1 km away from Dalhousie, Himachal Pradesh, India. The scenic trail continues 5 km south along the ridge to tiny Jot, with a couple of Dhabas, at the Chuari Pass (2772m) on the Chamba-Chuari Khas road. It is near to Khajjar Meadow. Bharmour, formally known as Brahmpura, was the ancient capital of Chamba district in Himachal Pradesh, India. Situated 60 Kilometers from Chamba, Bharmour is known for its scenic beauty and for its ancient temples. Some of the temples are believed to date from the 10th century. The place is famous for Temples of Lord Shiva. Main Attractions are Chaurasi Temple Bharmour, Bharmani Mata Temple, Kugti Wildlife Sanctuary, Tundah Wildlife Sanctuary, Thala Waterfall. One most famous place is Mani Mahesh which need special mention. The Manimahesh Lake is situated Twenty-six kilometers from Bharmour in the Budhil valley, one of the chief pilgrimage spots in Chamba. The lake is situated at an altitude of 13,000 feet at the foot of the Kailash peak (18,564 ft). Every year, on the eighth day of the light half of the moon in the month of Bhadon, a fair is held at this lake, which attracts thousands of pilgrims who assemble here to take a dip in the holy water. () . Manimahesh can be from many routes. Pilgrims from Lahaul-Spiti come through Kugti pass. From Kangra and Mandi, people can come via Kawarsi or Jalsu passes. The easy route is from Chamba and runs through Bharmaur. At present buses ply up to Hadsar via Bharmour. Beyond Hadsar, the pilgrims have to trek for 13 kms to reach Manimahesh. Between Hadsar and Manimahesh is an important halting place known as Dhanchho where pilgrims usually spend a night. There is a beautiful waterfall. About one and a half kilometers short of Manimahesh lake fall two religiously important water bodies called Gauri Kund and Shiva Krotri where as per popular belief Gauri and Shiva bathe respectively. The women pilgrims do take a holy dip in Gauri Kund and the men pilgrims in Shiva Krotri before proceeding to Manimahesh Lake. Pangi is tehsil of Chamba. One of the remarkable features of road connectivity in Pangi Valley has been the 170 KM road link from Chamba to Killar via Saach-pass. Earlier, people were required to undergo an ordeal of 800 Kms long journey to reach Killar from Chamba via Kullu and Manali . The entire Pangi Valley is divided in valley Saichu(22 KM from Killar), Hudan Bhatori and Sural Bhatori. To explore the hidden vistas of the region, one has to first get to Tissa (1570 meters altitude), a sub-divisional headquarter for Churah. Tissa, also known as Bhanjraru, is fairly well connected by road with Chamba town and Dalhousie. Beyond Tissa, the road connects up with the Kishtwar region of Jammu. It also provides access to the landlocked Pangi valley. This region is less connected to the outside world and therefore highly connected to the gods. Some of the famous temples of Churah are the Chamunda Devi temple at Devi Kothi and the Bhader Kali temple at Bhalei. Pangi Valley is not that much explored but once it will be connected with roads, bikers will find a new destination for their bikes.